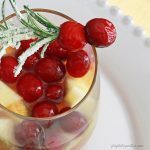 White wine holiday sangria with rosemary & cranberries is crisp and refreshing. It's the perfect holiday cocktail for Christmas Parties with family and friends! Cut apples into 2-inch chunks, and slice oranges into half-moons. Combine fruit with remaining ingredients, stirring well. Spread sugar over the bottom of a sheet pan or jellyroll pan with a lip. Lightly dampen fresh, clean rosemary sprigs with water or juice and gently roll in the sugar. Allow to dry at room temperature until a crust forms over the rosemary leaves. Break rosemary into 3-4 inch sprigs and remove a few leaves from the sturdiest end. Gently push the sturdy end of the rosemary stem through one or two fresh cranberries.